The NEMI Locator Pins are available in Vacuum Retractable or Solid. These locator pins are designed to locate your parts with ease! Push your part against the popup pin pod, turn on your vacuum and the pin drops down so you can profile around the entire paremeter of your part! Optionally you can use our solid pins that stay up for those times that you do not need a drop down pin. Vacuum popup pin pods are made from billet aluminum and precision machined on CNC machines. Proudly made in the USA! If you don't see the size you need, call us and we will make it! The NEMI Vacuum Slider Pod Blank Top is ready for your custom part. Just cut your groove and gasket and ready. The NEMI Dual Zone Vacuum Slider Pods or Cups enable you to hold 2 parts at a time. The NEMI Dual Zone Vacuum Slider Pods or Cups with fence enable you to hold 2 parts at a time. 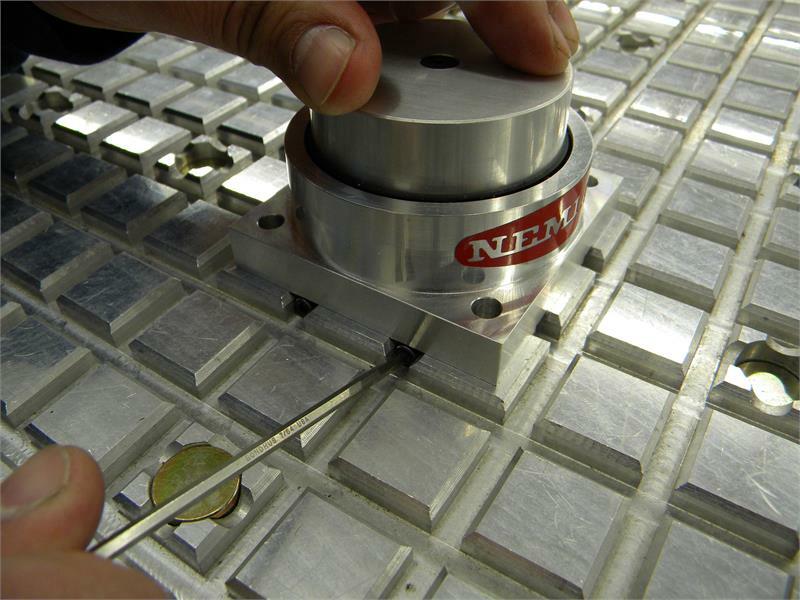 Replacement bases and other grid table bases Nemi makes bases to fit a wide variety of grid table patterns including Holz-Her, SCM/Routech, Homag, Weeke, Heian and more! The NEMI Vacuum Slider Pod Vise. This handy product from NEMI combines the rigid security of mechanical clamping with all the features of our patented Vacuum Slider Pod base.